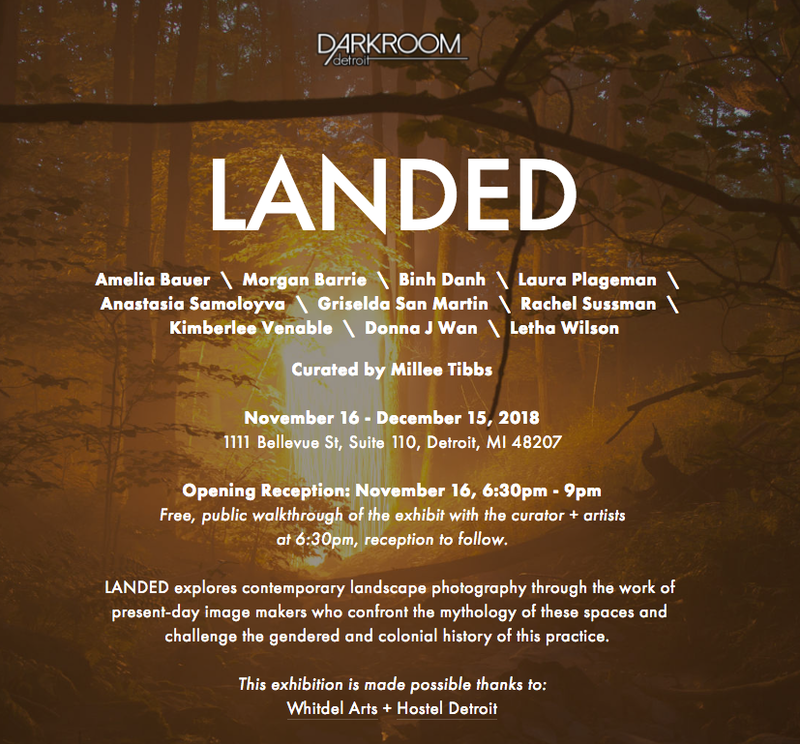 I’m pleased to announce that I am part of the Landed exhibition curated by Millee Tibbs at Darkroom Detroit. Other artists include Amelia Bauer, Morgan Barrie, Binh Danh, Laura Plageman, Anastasia Samoloyva, Griselda San Martin, Rachel Sussman, Kimberlee Venable, and Letha Wilson. The show runs from November 16 to December 15th. “From the Marlboro Man to Yosemite Sam, the West is often thought of as a place of maximum masculinity, a place of grit, determination and heroic self-actualization, particularly for cowboys, miners, bikers and the like. The misleadingly named Pacific Ocean can itself be seen as a site of adventure and danger. 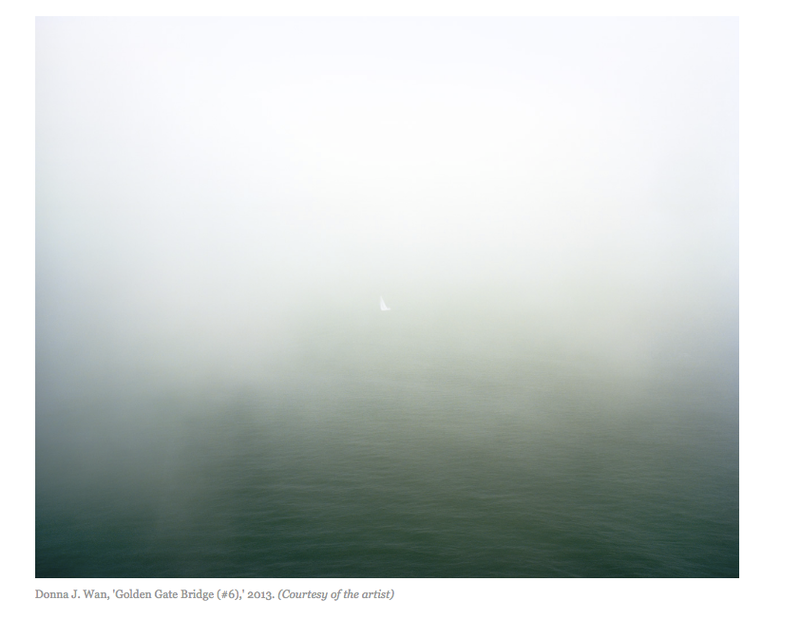 But in Death Wooed Us, Donna J. Wan presents the California coast in a series of seductive and often airy photographs. Golden Gate Bridge (#6), for example, depicts a small sailboat enveloped by the Golden Gate’s hallmark fog. The scene appears calm, but the insignificance of the boat against the backdrop of the Pacific suggests an inherent danger. The settings of Death Wooed Us aren't just beautiful sites to Wan—she chose to photograph locations that have attracted those wishing to end their lives. Wan herself was drawn to them when she experienced a severe case of postpartum depression. 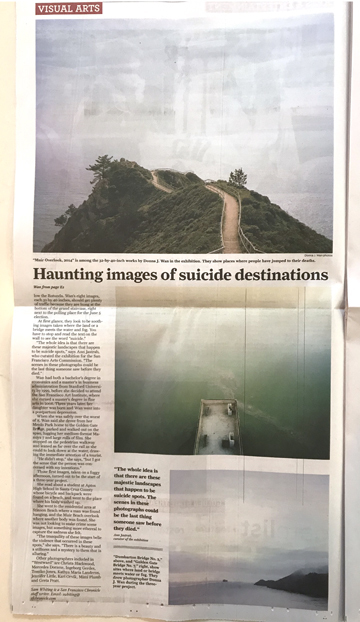 She says her intention was not to romanticize suicide, but to offer a glimpse into the minds of those who seek out beautiful places in which to die. Though it may take great strength to overcome the desire to end one’s life, Wan is open to and emphasizes this vulnerability. Westward, an exhibition curated by Ann Jastrab, is opening on May 11th, 2018 at the San Francisco City Hall. I'm excited to be in the year-long exhibition along with 9 other great photographers doing work about the West. Please join us at the opening reception! The San Francisco Arts Commission’s Art at City Hall program is pleased to present Westward, an exhibition that features ten female photographers documenting and depicting the West. Curated by independent curator Ann Jastrab, Westward presents an opportunity to break away from patriarchal representations of the West and its historical association with Manifest Destiny (a “masculine” endeavor and the subject of the male-dominated landscape artist field), and offers an alternative vision of this region of the United States. The exhibition features photographs by a diverse, multigenerational group of women photographers, including: Christa Blackwood, Mercedes Dorame, Ingeborg Gerdes, Tomiko Jones, Kathya Maria Landeros, Jennifer Little, Kari Orvik, Mimi Plumb, Greta Pratt, and Donna J. Wan. I am really excited that my work has been selected for Boundless: A California Invitational at the Museum of Photographic Arts in San Diego. 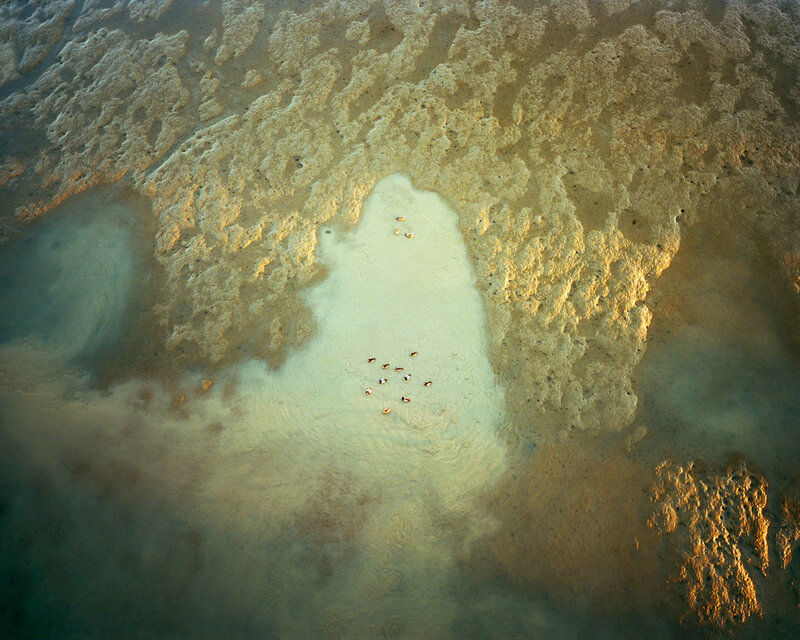 Five photographs from Death Wooed Us are featured alongside the work of estmeed artists Matthew Brandt, John Chiara, Kevin Cooley, Eileen Cowin, Jason Engelund, CJ Heyliger, Mona Kuhn, Michael Light, David Maisel, Alex Prager and Carly Steward. The exhibition will be on view from October 15, 2016 to January 29, 2017. The Members Opening Reception is on Friday, October 14, 2016 at 7:00pm. Please join me if you are a member! China-based Lens Magazine, a monthly print-only publication dedicated to culture and fine art photography featured my Death Wooed Us series in their August 2016 issue. Here are sample pages from the feature. My work and show are featured in both the print and online April 2015 edition of PDN. My latest project, Death Wooed Us, opens at Rick Wester Fine Art in New York, NY on March 19th. This is my first solo exhibition in New York, and I am thrilled to be represented by Rick Wester Fine Art. The opening preview is on Thursday, March 19, 6pm-8pm. Please stop by if you are in New York! 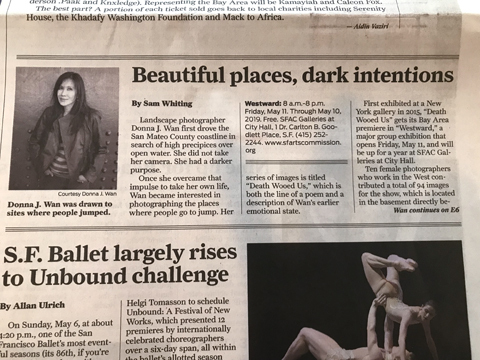 Death Wooed Us was also featured in Beautiful Decay, Aint-Bad Magazine, Photoworld (Chinese print magazine), and in the April 2015 (current) issue of PDN magazine. I am very honored to be selected as one of thirteen finalists for the CDS/Honickman First Book Prize for my In the Landscape series. The winner of this prize will be selected by Sandra S. Phillips, senior curator of photography at SFMOMA, in December/January and will be awarded a $3,000 grant and book publication. I am crossing my fingers! I have been selected as a 2014 Critical Mass Top Finalist for my new series, Death Wooed Us. Two hundred of the photo world's top curators, editors, publishers, and gallerists vote on the 50 most promising emerging and mid-career photographers. The award includes an exhibition curated by Rebecca Senf, curator at the Center for Creative Photography. I am extremely pleased to announce that the New York Times Style Magazine (aka T Magazine) commissioned me to take photographs of the Spirit Rock Meditation Center in the Northern Bay Area. A total of six photographs were selected and featured in both their online and print version of their special 10th Anniversary Issue available on October 19th, 2014. Both the photographs and the story titled "The Meaning of Life" can be found on page 178. I am very honored to have my work be included in such a wonderful publication. The Magenta Foundation has published a special 10th year anniversary edition of the Top 100 photographers from the USA, UK, and Canada. This special anniversary edition 4-book set showcases the work of the Top 100 past Flash Forward winners from each of the three countries. I am pleased to announce that I was selected as one of the Top 100 from a pool of 1,200 past winners. I was selected as a Flash Forward winner in 2007 with my "Dream Homes" project. I am pleased to announce that three of my photographs from the In the Landscape project were invited to be part of the By Invitation Only: Revealing the Landscape group exhibition at St. Mary's College in Moraga, California. The exhibition is open from August 10th through September 26th, 2014. Three photographs from my In the Landscape project will be shown alongside the work of Mark Klett & Byron Wolfe, Binh Danh, Chris McCaw, Michael Lundgren, Millee Tibbs, Matthew Brandt and Takeshi Shikama in the After Ansel Adams exhibition at the Museum of Photographic Arts in San Diego. The exhibition opens May 17, 2014 and continues until September 28, 2014. I have been selected by Linda Benedict-Jones, Curator of Photography at the Carnegie Museum of Art in Pittsburgh as the International Award Winner of the Fellowship 14 International Photography Competition. Work from my In the Landscape project will be on display at the Silver Eye Center for Photography from January 31 through March 22, 2014. The opening reception will be on Friday, January 31st, from 6-8pm. Silver Eye is located at 1015 East Carson Street, Pittsburgh, PA 15203.